Our ’We Aspire’ crowdfunding campaign is in it’s final days, and thanks to the support of 192 people, we have raised more than chf 22000, and reached 88% of our goal. We are offering lots of great potential Christmas gifts among our rewards, and also some cool limited edition items (check out our convertible rucksack, for example). 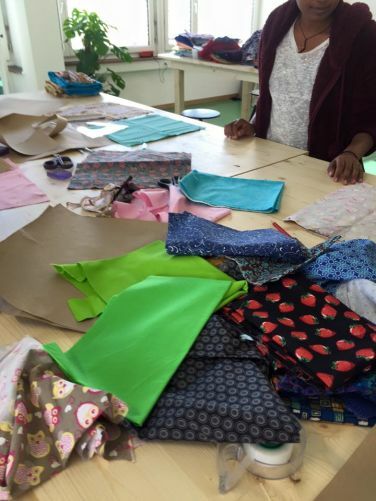 Help us to offer a work placement to a refugee tailor from Ivory Coast by supporting the campaign at https://wemakeit.com/projects/social-fabric-we-aspire ! Thanks to all of you for your on going support. We have our fingers crossed for a fruitful few days! Thanks to the support of 79 backer of our new ’We Aspire’ campaign, we already reached more than 1/3 of our goal. This means we are exactly on track – thanks to all of your who supported our new campaign! For those of you who haven’t yet, we would love to have you one board again – we are entering the crowdfunding ’valley of death’ – this means we need to work extra hard to keep the campaign momentum going. 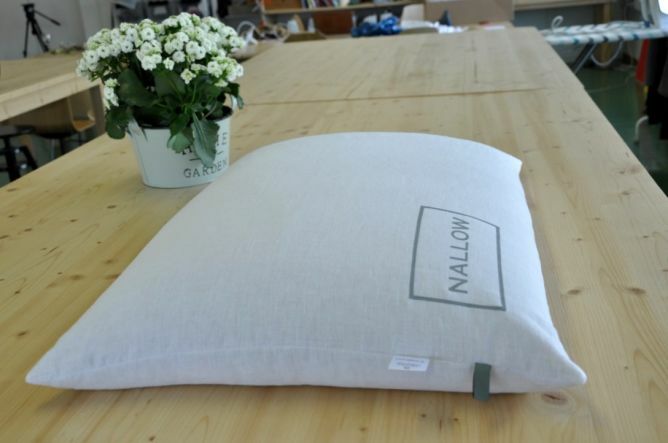 Check out our Nallow natural pillow – it’s made with belgian organic linen and filled with locally sourced millet husks. It’s great for relieving stress in your neck and shoulder while sleeping, because it conforms to the shape of your body. And here is our convertible rucksack – each piece is a unique item, made from organic linen and upcycled jeans. 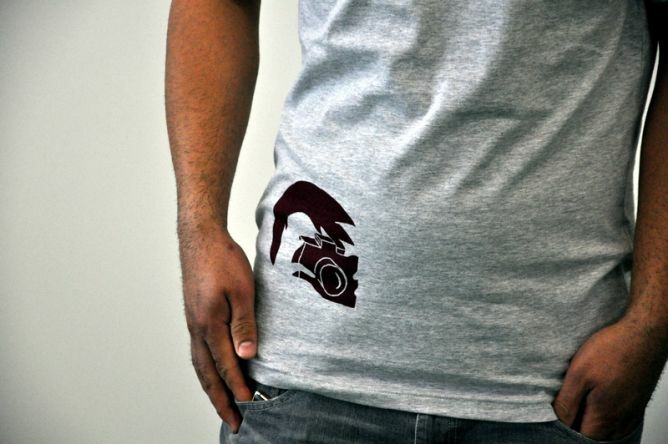 Also have a look out our two unique t-shirt models, that were designed at Social Fabric. All of these rewards are made at our studio here in Zurich. So seize the moment, join our mission, and support ’We Aspire’ now at https://wemakeit.com/projects/social-fabric-we-aspire. We hope to see you soon at Social Fabric! The aim of the campaign is to raise the funds for a six month work placement for Cisse, who is a refugee tailor from Ivory Coast. We are pre-selling items that will be made by him during his six month work placement. These items will be made in Zürich, from sustainable materials – for example CO2 neutral Belgian linen, organic cotton knitted in Europe, and Tencel (a wood fibre that is produced in Austria using a low impact process). Don’t wait – support us now! It’s all or nothing, so we need to reach our target, otherwise all of the contributions are returned to our supporters. Have a great day, and I hope to see many of you soon at Social Fabric! Yesterday evening we had an apero at Social Fabric to launch our new crowdfunding campaign, called ’We Aspire’. The aim of the campaign is to raise the money to finance a paid internship for one of the participants of our project. Cisse is a tailor from Ivory Coast, and he will make the campaign rewards as part of his internship. 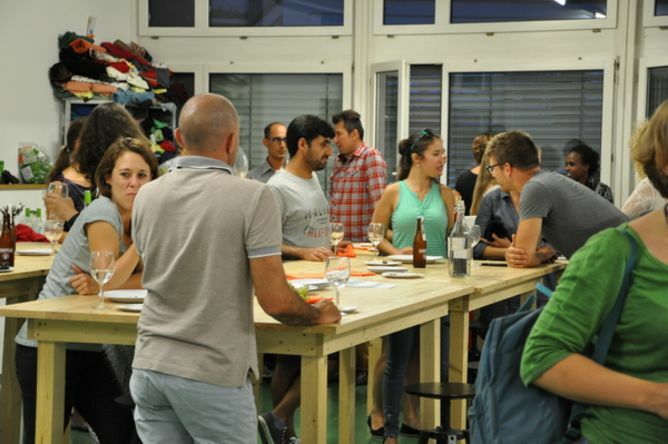 More than 30 people attended our apero, and we already raised more than chf 1600 since the campaign launched yesterday evening. Now we need your support as well, in order to keep going. These first few days are going to be critical – we need as many early supporters as we can get, in order to convince ’strangers’ to support the campaign later on. Visit our campaign at https://wemakeit.com/projects/social-fabric-we-aspire and support it right now (we also have a great video that you can watch to learn more about the project! 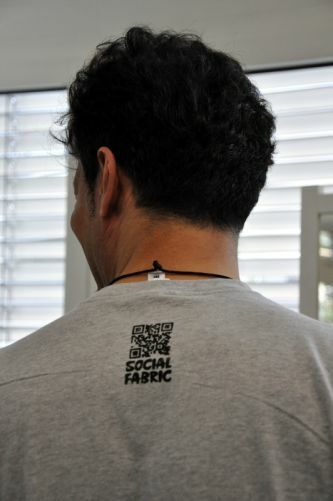 Since the beginning we at Social Fabric wanted to participate in creating the kind of society that we want to live in. We started by building a community of like-minded people who want to be part of something bigger, and we are thrilled at the amount of engagement we have seen from our community members, including you, our crowdfunding supporters. Thank you very much to all of you who have been part of our journey so far, as supporters, customers, and as volunteers. As part of our mission, we started to pilot programmes with refugees here in Zürich in June last year, and since then, we have had more than 30 refugee participants in our programmes. One of those participants is Cisse. Some of you might recognise him from an article that was published a couple of months ago in 20 Minuten. In case you didn’t read it, you can still find it online here (in German). 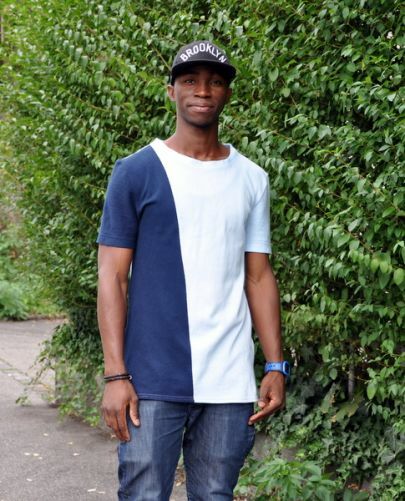 Cisse is a tailor from Ivory Coast, and since autumn of last year, he has been spending an increasing amount of time at Social Fabric working on his own projects and developing his skills. Cisse was an asylum-seeker holding an ’N’-permit in Switzerland, which means he hasn’t been allowed to work. Recently he received an ’F’-permit, which means he has permission to stay in Switzerland, and he is allowed to find a job. We have gotten to know Cisse well, and some of you have probably seen him working at Social Fabric. Cisse is a bright, hard working, and talented person, who has a lot to contribute to our community. Together with you, we want to provide Cisse with an opportunity to further improve his technical skills and gain some work experience that will allow him a great start to his professional career, by offering him a six month paid internship. In order to be able to do this, we are launching a new crowdfunding campaign (our ’We Aspire’ campaign) that will start September 1st and run for 30 days, in order to fund a salary for him. The idea is to collect pre-orders for items he can make during his internship, in order to finance the cost of his salary and benefits. We will have a selection of items designed in collaboration between Cisse and Carola Ruckdeschel, a wonderful local tailor who is working with us, and there will also be the possibility to make special requests for custom items. We are hosting a kickoff event on September 1st at Social Fabric from (19.00 – 21.00), and you are warmly welcome to join us for an apéro. If you have any requests for custom-made clothing, please also join us during that event to discuss your wishes with us, and have your measurements taken. We have created a Facebook event for our kickoff event, which you can find here. Please click ’interested’ to get updates about the campaign, and invite your Facebook friends to join – if we can spread the word early, we have a greater chance of success! 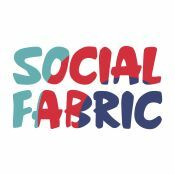 If you are not on Facebook and would like to attend our kickoff event, please RSVP by sending us an email at info@socialfabric.ch. In the meantime, have a warm and sunny summer, and we hope to see you all soon! It’s been about six weeks since our crowdfunding campaign ended, and a lot has happened since then. Much of these things have happened thanks to you, so we want to tell you again how much our successful crowdfunding campaign has meant to us! 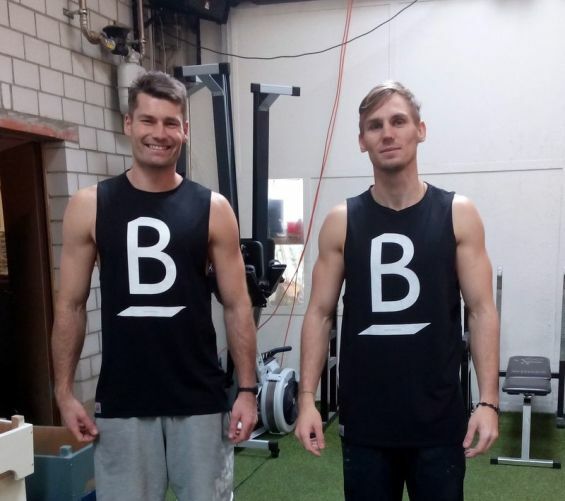 The local gym balboamove.ch saw our crowdfunding campaign, and asked us to make them 100 sleeveless sports t-shirts. We delivered them last week, they are now on sale at Balboa for chf 55 each. Balboa will give you a free workout when you buy a t-shirt, so visit Balboa beside the Zürich Brockenhaus. We got a grant from the COFRA foundation for our refugee project (yippee!). We are in the process of founding a non-profit association to manage our refugee work, and we are busy planning a refugee internship programme which we will launch in the new year. 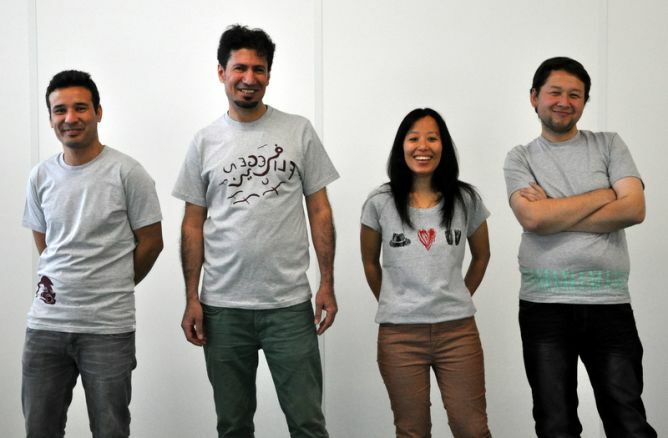 We are also preparing for the official launch of our refugee-designed t-shirts via a dedicated website. Stay tuned! We are planning to have opening hours at Social Fabric as of January (Mon – Thurs 14.00 – 21.00, and Sat 10.00 – 16.00), and we will be launching our memberships in the new year. Members can come to use our facilities and equipment during opening hours. For those of you who bought memberships through our campaign, we will send you more detailed info during the next week. We’ve delivered about 75% of our crowdfunding rewards now, and except for those of you who have purchased memberships, we’ve been in touch with all of you. If you haven’t done so yet, don’t forget to get back to us regarding your colour or design preferences for your reward. I’m in Canada until the end of December now for some much needed family time, but I can’t wait to come back after Christmas and dive into all of our new projects. If you have any ideas for collaborations with us, or just want to say hello, don’t hesitate to get in touch. Thanks for the huge amount of community support for our project! We are thrilled and proud that we just passed our funding goal. This is thanks to all of you for supporting us, and for sharing the project with your networks. We have two days left in our campaign – anything above and beyond our chf 15 000 goal will go directly to our refugee project. Looking forward to seeing all of you at Social Fabric! We had a couple of realisations over the weekend; a number of people approached us to see if we are willing and able to carry out local production for small labels. 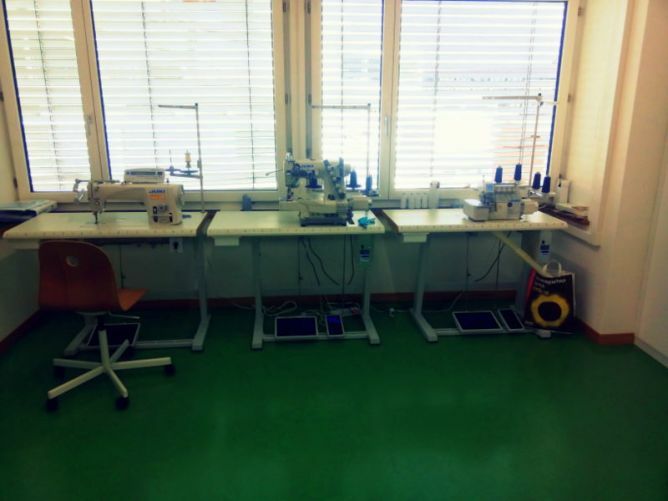 Even though Switzerland doesn’t have a sewing industry anymore, we think that there might be interest again in local production. A lot of the people who visited our room really liked the idea of ’made in Zürich’. Let’s see how this develops… wouldn’t it be great if we could develop a real production team from amongst the participants in our refugee programme? Secondly, when conventional clothing is made, the cost of labour is a relatively small part of the total cost. For example, an experienced sewer can make a t-shirt in about 1.5 hours, and the speed increases with industrial production. In Bangladesh, where workers are paid 2 CHF per day or less, it costs about CHF 0.25 for the work involved in making a t-shirt. This is very small compared to the cost of the materials. In Zürich, where the wages are much higher, the labour costs are by far the biggest fraction of the total costs of the shirt. The cost of the work isn’t something that customers can ’see’ when they look at a product though. This means that to really stand out, we should use super-high quality and special materials for our products. We need to keep this in mind in order to keep our customers happy. Do you have any thoughts or feedbacks about our learnings? Visit our campaign, and post a comment! Yeah yeah yeah… we’re half way there! Isn’t it fitting, that we are exactly half way through our campaign, and we just hit 50% of our funding target. Thank you so much to the 86 people who already supported our campaign. I am incredible grateful that you, our community, have rallied around Social Fabric to help us reach the next step in our journey. So, I wish you all a bit of sunshine on this rainy day, and I’ll see you soon! Check them out, and if you didn’t already buy one through our campaign, buy one now! 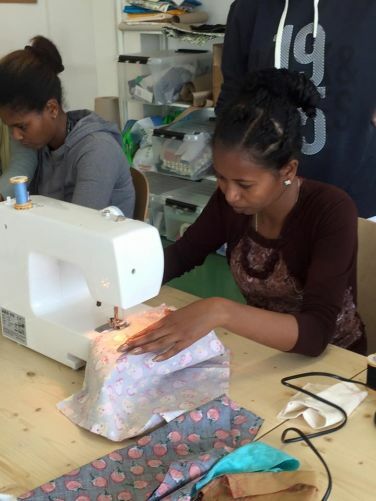 Last week we re-started classes in our new location, and today we started our new drop-in programme for refugees who can come to learn how to sew. 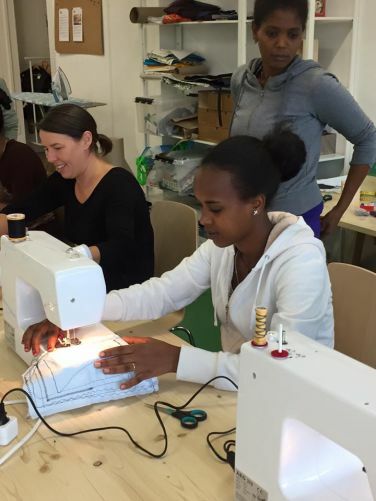 We are open to refugees every Thursday morning from 9am – 12pm, and we have several volunteers on hand to teach sewing and alterations. 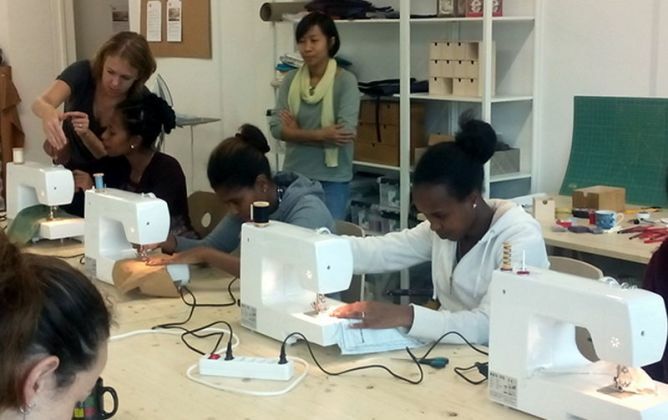 Today we had four funny ladies from Eritrea, none of which had ever used a sewing machine before. Darios (famous from our video!) came to alter some trousers, and Choedon, from Tibet, and one of our t-shirt designers, made a totebag from some fabric that was donated to us for our programme. We are looking forward to many fun and interesting Thursday mornings in the future! First, thanks to the 47 people who have backed Social Fabric during the first nine days of our campaign! I can’t express how happy and relieved I am that we have receive so much support so far. Well, I shyly asked Corinne if she thought that we could cut another short video for the contest, and she, being the generous person that she is, said yes. So, here it is… why you should visit Social Fabric’s room at the Fashion Hotel in October :-). Spread the word that if you buy a made-to-measure t-shirt via our crowdfunding campaign, we will send you two free tickets to the fashion hotel (44 chf value), and we will make your t-shirt while you wait at the event. This project ended successfully on 28/10/2015 18:00! Thank you! We will send you a hand-written postcard with our heart-felt thanks for your support! Get a «Farmhouse» bag – great for shopping or going to the lake in the summer. These bags are made from laminated jute and recycled saris, and come from Freeset, a social enterprise in India that trains and employs former prostitutes in sewing and textile printing. Get a feel-good scarf to keep you warm for the autumn. Made from a blend of cotton and wool. Hand-woven by a family run weaving company in West Bengal, India. You have a choice of three different designs. You will receive an «Amity» messenger bag made by our Canadian partner, Common Thread. You can choose from blue, green, or rainbow coloured. 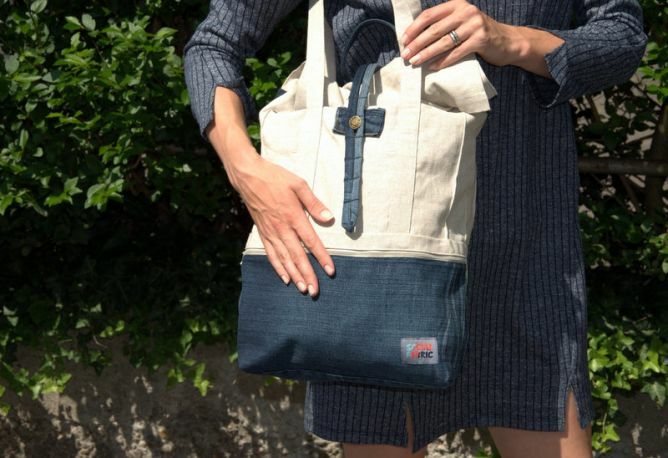 These bags are made from recycled street banners (flap and inside pocket), as well as grey twill fabric that was donated to Common Thread by the 2010 Vancouver Olympic committee. The bags are made in Canada by women who otherwise have trouble to enter the workforce. 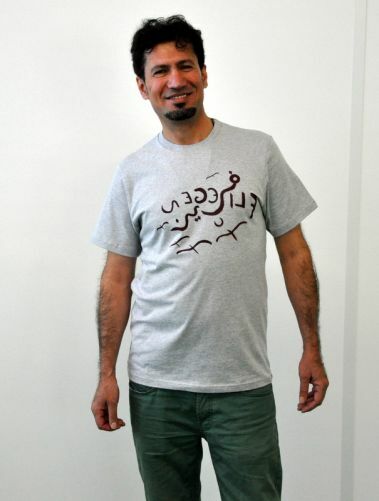 Refugee-designed t-shirt. 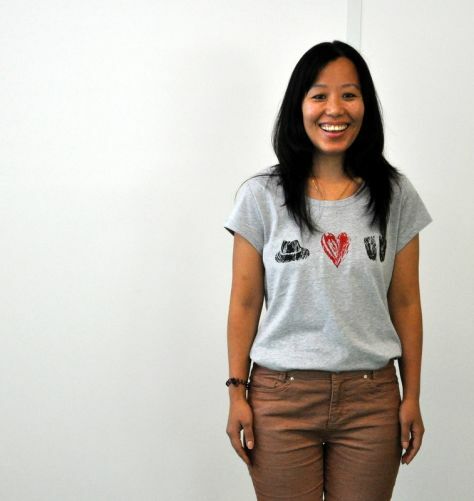 These t-shirts are made from organic cotton, and come from Freeset, a social enterprise in India that trains and employs former prostitutes in sewing and textile printing. Choose from 4 designs; each design was created by a refugee in Zurich, and there is a story behind it that you can read at www.socialfabric.ch/rethread. T-shirts are screen-printed in Zurich. Available in a men’s model, or a fitted cap-sleeve ladies model. Amity cowl-necked t-shirts for women. Available in yellow/grey strip, or grey with an antique Indian block print. Made in Zurich, using high-quality organic cotton jersey. 1 month Starter membership at Social Fabric. With this membership, you can come to Social Fabric and use our equipment and facilities during opening hours for 20 hours in a calendar month of your choosing. Christmas decoration workshop and lunch on Saturday November 21st. We are offering this exclusive workshop only to supporters of our Wemakeit campaign. Spend a grey November day (10.00 – 16.00) in our nice bright studio, learning how to sew Christmas decorations for your Christmas tree, and to give as gifts to all of your friends. Take a break in the middle of the workshop to enjoy a hearty, homemade lunch. Make your own t-shirt workshop and lunch on Saturday December 5th. We are offering this exclusive workshop only to supporters of our wemakeit campaign. 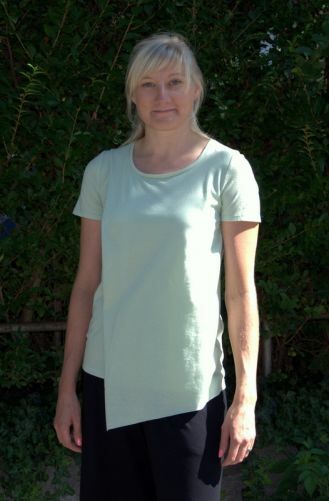 Spend a grey November day (10.00 – 16.00) in our nice bright studio, learning how to sew your own t-shirts. Take a break in the middle of the workshop to enjoy a hearty, homemade lunch. Language of instruction is English. Reversible wrap skirt from our ’Amity’ line. These wrap skirts come in four different colour combinations, and you can pick your favourite. They are made from organic cotton, and are produced by women who otherwise have trouble to enter the workforce at our Canadian partner, Common Thread. 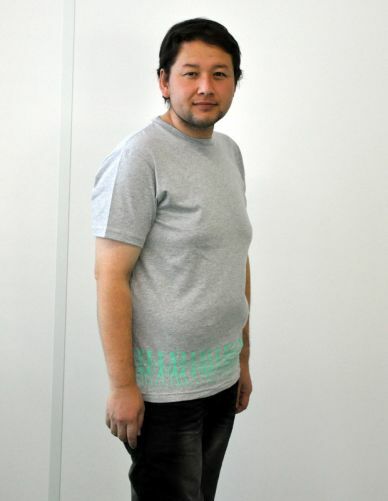 Made to measure t-shirt. Come to Social Fabric and choose from a selection of our high quality organic jerseys. Our in-house tailor will take your measurements, and make you a t-shirt according to your specifications. We will engrave your name on the side of our pattern-making table, and you will be forever remembered as one of the first and most valuable supporters of Social Fabric. Buy the dress that Heather is wearing in the Social Fabric video clip! Organic fabric is manufactured in Portugal, and is a high quality double jersey. The dress is hand sewn in Zürich, and comes in small, medium, or large. You well get your choice of custom colours if you select this reward. 6 month Starter membership at Social Fabric. For six months, come and use our equipment and facilities for 20 hours per month during opening hours. This 6 month membership costs only 90 CHF per month, or 4.50 CHF per hour! 6 month Co-worker membership at Social Fabric. This membership is perfect for people who wish to work with textiles on a semi-professional basis. For six months, come and use our equipment and facilities for 20 hours per week during opening hours, and receive a 10% discount on all of our courses. This 6 month membership costs 220 CHF per month. Have you always wanted to be a clothing designer? Here is your chance! You don’t need to have ANY training or experience. Work with our team to design a clothing item of your choice, which will be incorporated into our ’Amity’ sustainable clothing line, and will be made available for sale to our customers, as well as to your friends. For real! You will also get one of your designs to keep, made-to-measure. This reward is only available to people who are available in Zurich to work with our design team.